Driving Test Complete – The UKs best Driving and Theory Test software product for car drivers and motorcycle riders. 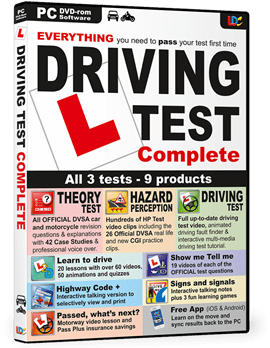 Driving Test Complete offers you hundreds of Hazard Perception Test clips to practice on with comprehensive tutorials and videos on how to make your first test your last. Includes the 26 Official DVSA sample clips. No other product offers a more accurate video of a full driving test than the Driving Test Complete. Video is shot from outside the car in the same format as on the real test – not from behind the windscreen of the car in a lower, grainer resolution as on many other products. Nobody can match the quantity or quality of the shots we provide. Use the Contact Us link to order Driving Test Complete through us. Posted by admin in ldc in pontypool, ldc in torfaen, learn to drive in pontypool, learn to drive in south wales on February 4th, 2016 ‌ Both comments and pings are currently closed.